Using a 4 levels raised storage area, Macrack was able to essentially grow NIOA’s floor space the equivalent of an extra 3 football fields, with shelving throughout. Read the story below. MACRACK was contacted by NIOA Trading to help them design their new state-of-the-art facility. 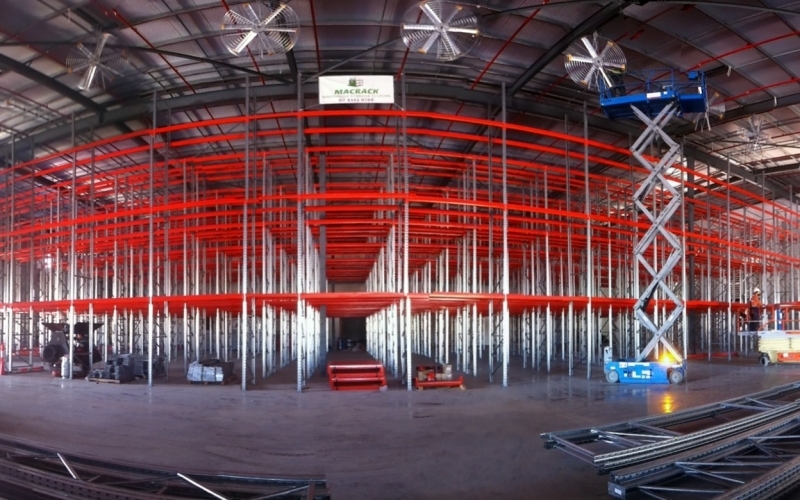 They originally saw the MACRACK mezzanine warehouse system when visiting a partner business, and they immediately knew it would be a perfect match for their warehouse. NIOA’s warehouse manager and production manager were originally looking at a 15,000m2 area for handpicking on the ground, plus approximately 1,300 pallet spaces. This would have been an inefficient use of space, as it would not have utilised their high ceilings and picking items could be over 100 metres away. NIOA contacted us with the idea of instead reducing the picking area footprint; they could then operate more efficiently while allowing more space for hardstand as well as additional area for receiving and dispatch. We took up the challenge because we knew we could provide them with a great tailored solution that would maximise their storage capacity and minimise workloads. And other factors and components. This was no small feat, especially considering the raised storage area was located within a federal government land parcel near Brisbane Airport; this meant each design specification was fully compliant to all Australian Standards, passing stringent guidelines that were physically tested. 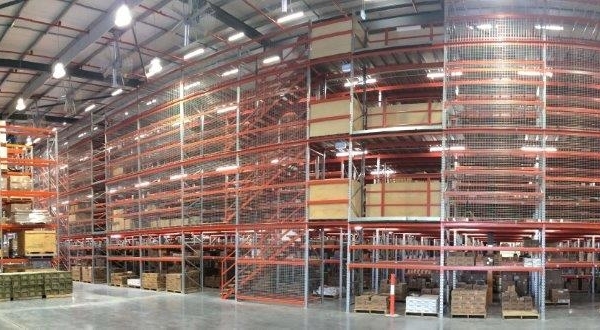 The result for NIOA was a fully integrated raised storage area (warehouse mezzanine floor), which is four levels high, with a footprint the size of a football field. Each level is joined together by numerous sets of stairs, and pallet gates allow staff (and product) to easily flow through the areas while ensuring the highest safety standards are constantly met. This was no small feat, especially considering the raised storage area was located within a federal government land parcel; this meant each design specification was fully compliant to all Australian Standards, passing stringent guidelines that were physically tested. When an order is picked, it is packed on the same level and transported down a motorised conveyor to the dispatch area on the ground level. This eliminates double handling and streamlines operations, as all items are ready to go and matched to an order when they hit dispatch. Staff can rapidly move from level to level, further improving communication and efficiency. As Australia’s premier armoury and ammunition distributors, NIOA’s product is complex in nature, comprising many small picking items that are quite heavy, as well as large pallets of stock that vary considerably in size and weight. MACRACK has designed the perfect solution for their needs.